If you are searching for a lightweight, portable fabric steamer to make your trade show fabric display look crisp and fresh, check out the five models listed here. Setting up a trade show display is both exciting and nerve racking at the same time. There are boxes to move and unpack. There is business literature to organize. You may have product photos and samples to give out. Many booths use fabrics to cover tables, create partitions and as banners. Having an easy-to-use portable fabric steamer is the perfect tool for creating a crisp, fresh display that speaks volumes about your business. Trade shows are a wonderful way for us as consumers to learn more about companies and what they have to offer us. I have been to several trade shows in my hometown and it's a lot of fun. There is always good food around. Companies hand out neat little freebies and treats. You get to enjoy meeting people, exchanging ideas and finding the perfect product to solve a problem you have. Trade show traffic rarely thinks about what the booth operator had to do to get it all organized and looking good for the show. For the business setting up the booth, there is a lot of pre-planning involved. You only have a certain amount of booth space. You need to haul your products, pamphlets and displays. You also need to check that your fabric table covers are smooth and professional-looking. Whether a business is showcasing textiles hung on a rack, a table cover, or a fabric logo, using a steamer to remove traces of storage "crinkles" is the professional standard. 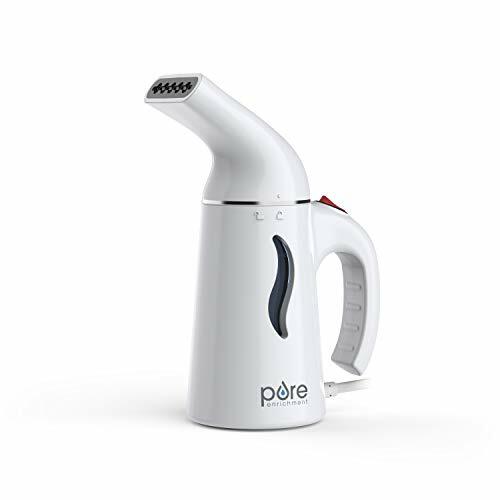 This compact model heats up in one minute and gives you 15 minutes of steam time per fill. It takes 8oz of tap water for one fill. It is versatile enough to use at home, when traveling, and at the office. The ESTEAM is probably better for light to moderate wrinkles. 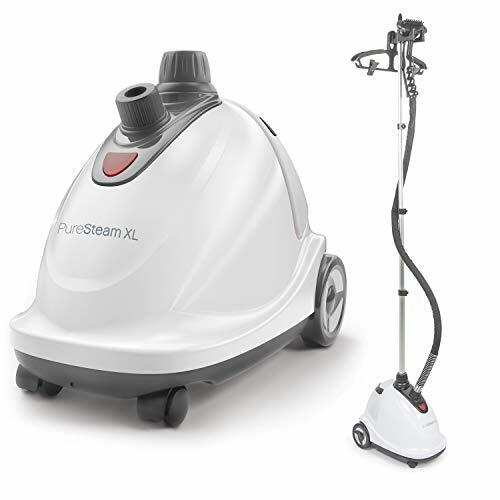 This model concentrates a higher density of steam for smoothing out stubborn fabric wrinkles. 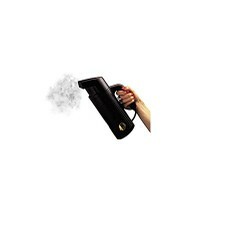 It heats up in 2 minutes and gives you 10 minutes of steam time per fill. The 8ft cord comes in handy for working around tables and displays. The safety features include automatic shut off if the water gets too low or is knocked over. The Elite portable has an inner core made of high-tech materials that produce concentrated wrinkle-busting steam for those tough jobs. It comes with a long 9ft cord and offers auto shut down for safety if the water level gets too low. It heats up in 2 minutes with 12 minutes of steam time per fill. The little portables are very convenient because they travel so easily, You don't necessarily have to stash them away for trade shows either. You can use them year round at home for your clothes, curtains and linens. Although the smaller devices are easy to take with you, they don't offer long steam release per fill. One water fill may get you 12 minutes of steam. This is something to think about at a trade show. For commercial venues and set up crews, a steamer that can run through large amounts of fabric is a must. This model offers one of the longest steam times between fills; one hour. The 1/2 gallon tank is removable for convenient refills. The Epica gets positive reviews for its residential use, but is a great option for handling fabrics at trade shows. It's a smaller model, but gets the job done if you don't need one hour of steam time. The best feature about this machine is how quickly it heats up; 45 seconds. 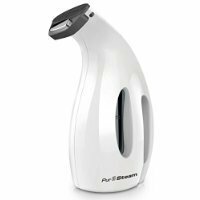 What's The Difference Between The Puresteam XL And The Epica 1500 Watt Steamer? The Epica is smaller and shorter, but costs less than the Puresteam XL. Today, many trade shows offer high-tech ultra-modern booth construction options. You see curved Plexiglas counters and solid cubicles. Displays might have backdrops created with waterfall illusions, light shows, glass bricks, rubber rings, chains, video enhancements and more. One type of trade show that uses fabric and lots of it are those based on weddings, fashion, theatrical supplies and the beauty industry. However, many trade show venues are loaded with fabric. Generally we don't notice, but you can really see how much fabric is used to cover tables, create borders and make backdrops so each business has their own little nook. Now, imagine hanging up and draping all this fabric. You would think with all the noise and excitement of the crowds attending trade shows that a few wrinkles here and there wont be noticed by the general public. They may not notice a lightly creased tablecloth, but they will notice rumpled backdrops and partition fabric. Just as well-pressed clothing makes a person look groomed and neat, the same goes for fabric displays and table covers. Potential customers are going to get the idea that a company is careless and sloppy if they use wrinkled fabric at a professional business show. After the venue is over, all those curtains, partitions and covers are folded and packed away until next time. They will get creased and rumpled during storage. Both the set-up committee for the general floor plan and the individual booth operator will have to face those post-storage fabric crinkles each time the show must go on. 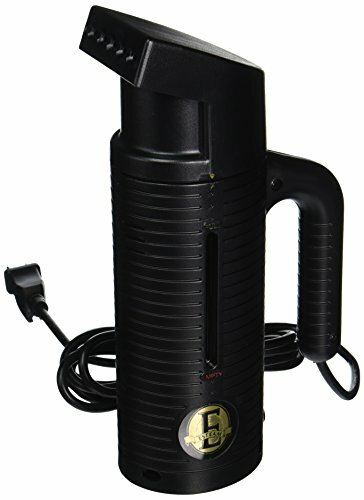 Steamers are great gadgets for the trade show business. I have never thought of these in connection with trade shows, but watched someone use one to get the wrinkles out of her cloths when traveling, and have thought of getting one since. After a storm knocks out power, it is important to get an alternate power source activated. There are several options, including solar panels, wind turbines, and generators.